AM-EX Blog: Steam Surface Condensers Are Much More Than Just Tubes! Steam Surface Condensers Are Much More Than Just Tubes! This article is published by American Exchanger Services, Inc. or simply AM-EX for short. AM-EX specializes in the design and fabrication of new steam surface condensers, as well as the field service and retubing of existing steam surface condensers. AM-EX has specialized in surface condensers for over 32 years. Most of the operating attention of steam surface condensers is the tubing. There are many articles about cleaning and plugging because they contribute most to the operating cost of the condenser. Fouling of the tubing and plugging when the corrosion goes through wall can cost availability and efficiency as well as the direct costs for cleaning and plugging. While not as critical to the normal operation until a failure, the tubesheet operates under a number of significant operational challenges. The edge of the tubesheet acts as a very large flat faced flange, often with one side permanently gasketed to the high vacuum of the shell and the other side of the tubesheet which sees the cooling water pressure. Gasket leakage on either side can be a significant issue. The tubesheets also see the same water as the tubes do. They are subjected to the same corrosion concerns as well. Since the tubes and tubesheet are coupled by conductive water, there can be concerns about the galvanic potential between the tubes and tubesheet. Impressed current systems or anodes may be required for corrosion protection. The tube material and the type of impressed current systems when chosen poorly can result in premature failure of the tubes or result in damage of the tubesheet. Improper selection of the anodes for the tube material can also result in more damage rather than protection. Rolling tubes into tubesheets is critical to the operational integrity of the condenser. During production by quality manufacturers such as AM-EX, great attention is given to the size and finish of the tubeholes. With constant attention to wall reductions using actual wall thickness and actual hole ID’s instead of using averages, tight long term tubejoints can be achieved. In each of these joints, however, is some small expansion of the tubehole. If there was no such small increase in the tubehole, the tubesheet would not “hold” the tube tight. While the amount is very small, it does add up over thousands of holes. The net effect is to grow the tubesheet in size. When the size is constrained, the tubesheet wants to buldge. The tubesheet, however, is kept from buldging by the tubes which act as stays and by a long pass partition if the condenser is a two pass design. This will tend to put a longitudinal load on the tubes which may be compressive and/or tensile. While two piece tube plugs are becoming more common, there is still a significant amount of usage of taper pin plugs. When these pins are hammered into a tube or tubehole, they can dramatically increase the tube and tubehole diameter as well as change the shape of the hole to a taper. Such deformations can add substantially to the stresses in the tubesheet and the tubes. A large quantity of taper pin plugging can essentially destroy the usability of the tubesheet if a condenser retube is warranted. On second retubings this can become an even greater problem since the tube joints are being rerolled (i.e. expanded tubeholes) plus the accumulation of deformations from two sets of plugging. The saving grace to this issue is the fact that the differential pressure that the tubejoints need to seal is often only 100 psi or less. Poorly rolled or over rolled tubejoints can seal well enough to pass the shellside standing water tubejoint test normally performed after retubing. When the tubesheet strain gets high, the tubes and tubejoints must take the strain since the tubesheets want to deform and this deformation is resisted by the tubejoints and transferred to the tubes. When considering a retube with a new tube material, it is important to consider the replacement of the tubesheets as well. AM-EX has the capabilities to drill and replaced condenser tubesheets to meet critical path delivery. This will also afford the opportunity to replace the support plates to upgrade and/or modify the design as well for the new material. Such replacements may be done as complete bundles (modular replacement) or as packages (tubesheets, support plates and internals) when space is limited. Using a company with field experience and design and fabrication expertise is very important when going beyond stripping old tubes and stuffing new tubes. Please contact AM-EX in this regard. When tubesheet replacement is performed, it is often advisable to replace the condenser to tubesheet gasketed joint with a welded joint. Welding the replacement tubesheets to the condenser instead of gasketing will minimize the long term potential for the shell/tubesheet gasket to be a source of air inleakage. Sealing a tubesheet to shell flange type leak is difficult. When welding the tubesheet to the condenser shell, it often becomes a question of the weldability between the carbon steel shell and the tubesheet. For some combinations of tube/tubesheet this may not be possible. Favored tubesheet materials such as Muntz are leaded to facilitate drilling, but make the material virtually impossible to weld. Welding Copper Nickel to the steel is possible but requires skilled welders and procedures to make it work, especially in an overhead position. In the shop, such welds, along with the requisite quality controls and ability to position, make them more achievable. Some Titanium tubed units will have an explosively clad titanium layer on carbon steel which makes the final weld carbon steel to carbon steel. When using a super ferritic tube material such as SeaCure™, high strength Duplex alloys such as 2205 for fresh water and 2507 for seawater are often provided as tubesheets which can be welded to the carbon steel condenser shell. Besides the discussion of the tubesheets, another operational concern in the steam condenser is the high energy drains. Usually, these drains are from the feedwater heaters. The flashing of the drains as they enter the very low pressure in the condenser can cause significant damage to nearby tubes and internals. The flashing of drains is normally done against some impingement device. In condensers built by AM-EX, the energy from these drains are usually dissipated by an internal heavy Cr-Mo diffuser sleeve. It is designed for the significant amount of differential thermal expansion which such inlet lines can experience. This type design is highly erosion proof and provides the volume for the expansion prior to the entry of these drains into the open portion of the condenser. 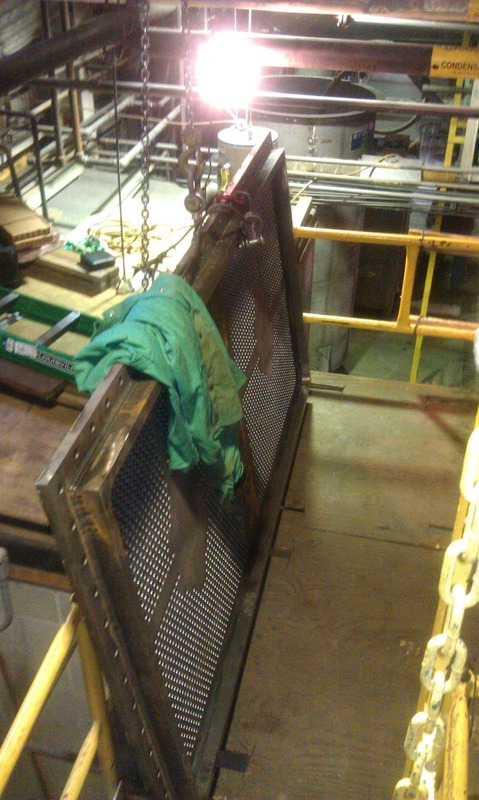 The air removal section in the condenser is critical to the operation of the condenser and the plant. Erosion damage or lack of cooling surface in the zone, can significantly increase the steam pressure in the condenser shell. Any increase in the back pressure can be an expensive proposition. As non-condensables accumulate, the partial pressure of the steam decreases. This decreases the saturation temperature and lowers the LMTD which then lowers the amount of steam which is condensed and the amount of steam drawn through the turbine for generation. The air removal section is usually a separately shrouded portion of the tubes. There are tubes in this section which knock out non-condensables and allow egress of the remaining vapor to the lower pressure provided by the air ejectors or vacuum pumps. This air removal section is exposed to the more corrosive non-condensables with corrodents such as amines and oxygen. The OD of the tubing in this section may exhibit additional corrosion concerns and the shrouds may suffer premature failures. Loss of full performance of this section can significantly impact thermal performance. Another advantage of the tubesheet replacement option in which the supports are also replaced, is the ability to modify the air removal shroud design. This allows for the venting system in the condenser to be replaced or modified to allow for better performance. Getting the cooling water into the tubes requires the waterboxes. These are on each end of the condenser. They are often coated with a coal tar or other coating for corrosion protection. 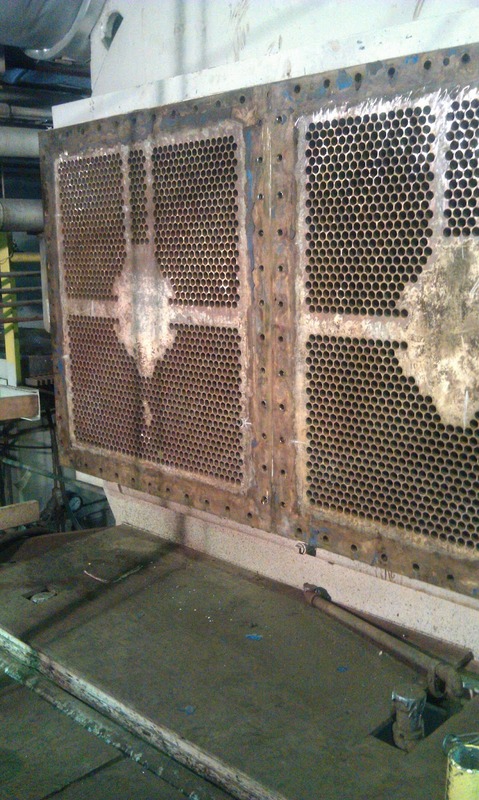 Holidays in these coatings can result in rapid perforation of the waterboxes and require downtime and weld repairs. The cooling water nozzles are also a source of corrosion and occasional need of replacement. Of particular concern is the expansion joint in the piping. When they are perforated, the entire waterbox needs to be removed and the replacement made. These are large diameter pipes and expansion joints which are design for relatively low pressures. The other expansion joint on the condenser is usually between the transition dome in the top of the condenser and the turbine. This joint sees the high vacuum and also responds to the cycling of the condensers during operation. The corrugations in some of the transition joints can suffer from fatigue cracking and corrosion. The rubber joints can become hard and brittle during years of operation. When they are installed, there may be substantial welding involved which may be subjected to flow erosion, piting or cracking. Weld repairs can be difficult to make due to tight clearances.